How do you move a used car dealership into the fast lane? An attractive, responsive website is a great start … if you can get people to visit it. But Heather Craig, owner of Halo Autosports, can verify that driving web traffic is a tricky business. Halo Autosports, located near Tampa, Florida, specializes in preowned vehicles, motorcycles, and powersports. Heather found out the hard way that the biggest names in the car dealership advertising business don’t always deliver the biggest results. 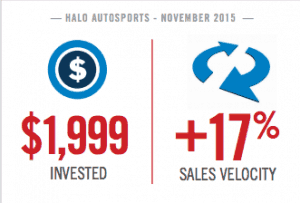 While Halo Autosports originally “spent a lot of money with Autotrader and Cars.com,” Heather eventually came to the conclusion that they needed a digital solution that brought shoppers more directly to the vehicle detail pages (VDPs) on their website. Find out more about how LotLinx has helped Halo Autosports become the top used car dealer in its area by reading the case study here.